On March 24th, 2013 Nahda Foundation and the Middle East Scientific Society organized a meeting with Mr. Stanislaw Guliński, Polish diplomat in Tripoli and Benghazi, currently working in Polish embassy in Cairo, an eminent scholar, traveler, guide, translator, journalist and author of the book: “Całkiem Bliski Wschód”. Traveling through the Middle East, he notices what is invisible to the television cameras and reporters or casual tourists. 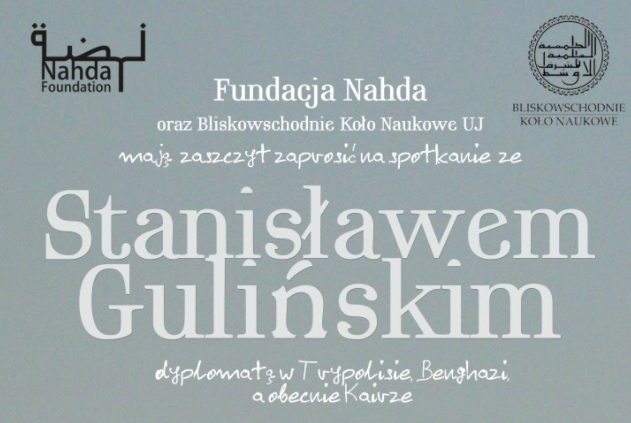 The meeting was chaired by the President of the Nahda Foundation – Daniel Gołębiowski.